You Are Here: Musicians / Bagpipers / United Kingdom / North of England / Pipe Major David Waterton-Anderson, KSG, KMM, OLJ, OMLJ. 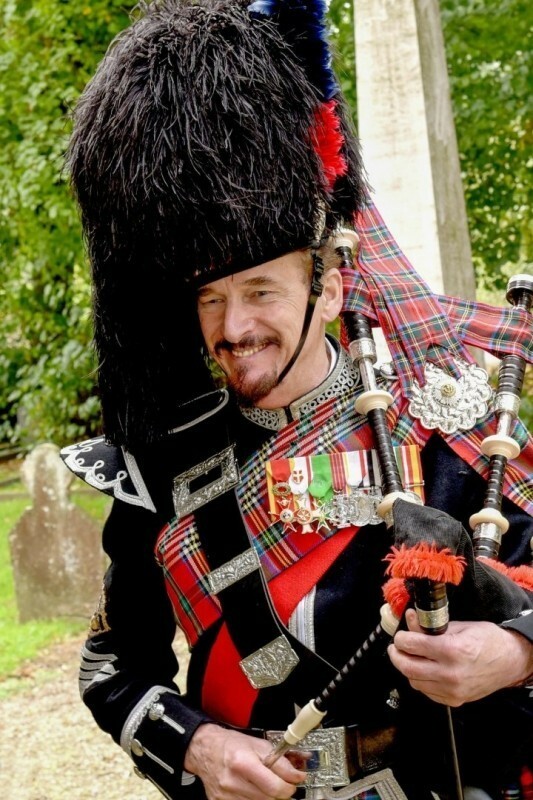 Quality traditional Scottish highland bagpipes for weddings, with the assurance of extensive experience and a sense of both style and occasion to enhance the ceremonial aspects on your special day. Based in North Yorkshire but offering a Nationwide service. 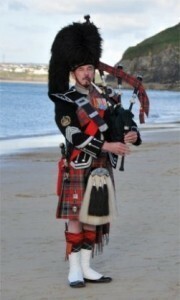 Whatever the occasion, the use of the highland bagpipes creates an atmosphere imbued with tradition. If it is a wedding, the ceremonial can be enhanced when the bride is piped into the ceremony and out again. 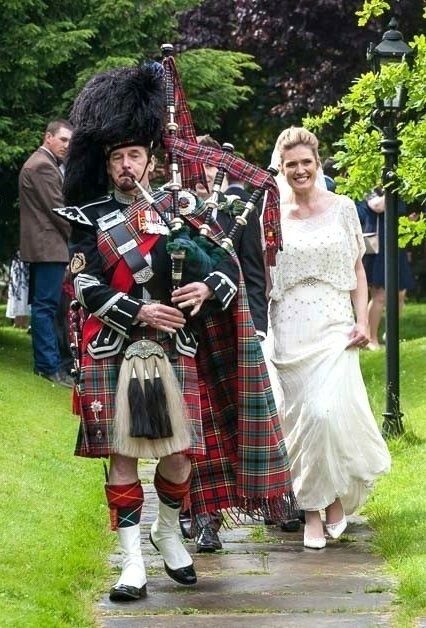 The grand entry into the wedding reception highlights the importance of the couples first steps into married life, sealed with a traditional piper's toast to the newly weds. Parties can also have a significant element by using the bagpipes for dramatic effect - perhaps in the engineering of a surprise. The pipes are also well suited to provide that solemnity in the ceremonials for a fu ... neral, adding that special touch for a dignified send-off. Choice of tunes will inevitably be a cooperation between the piper and the client, depending on the style and format of the event. 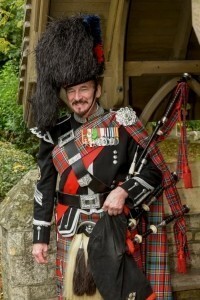 Since he was a seven year old Boy Scout in Scotland, eagerly seeking a musician’s arm badge, Pipe Major Waterton-Anderson has been honing his skills with the Scottish bagpipes and through many years in both pipe band work and playing solo, he possesses a wealth of experience upon which he can draw. In recent years, he was Pipe Major of the "Pontefract & District Caledonian Pipe Band" as well as Pipe Major of the "Ainsty Pipers" group. 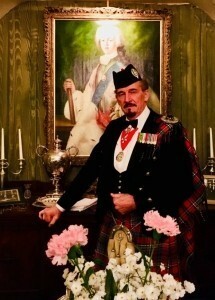 David was appointed "Personal Piper" to His Grace The Duke of Hamilton & Brandon in 1996 until the Duke's death in 2010. 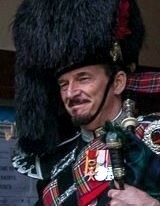 In 2013, he was invited to become a ci ... vilian guest piper with the 1st. Batt. Scots Guards. A 'Freeman' of the City of Glasgow, a tartan designing member of "The Incorporation of Weavers of Glasgow," he is one of only three living pipers in the UK to have been honoured with a State Knighthood. Dear David, I must express my very grateful thanks for all the help you gave me for my first attempt at organising a Burns Supper. Your contribution with both your piping and your speech on Burns was just excellent and so many members have expressed how much they enjoyed the evening. The Captain for next year has said he would like you to come back in 2020. Kind regards. David was amazing and really added a special touch to our big day. I was close to tears when my we approached the church to hear David playing 'Flower of Scotland' as a surprise for my father. So many of our guests wanted to have a photograph taken with David in his fabulous outfit. Hi David, We just wanted to send a special thank you for helping our wedding day to be the fabulous event that it was. My entrance was a blur and I didn’t hear you play too much but the walk out and the breakfast entrance were amazing. Gordon thought you were fantastic and everyone commented on the quality of your playing, the way you looked and you’re seamless blend with our guests. A truly memorable day so thank you. David piped at our wedding. David was absolutely fantastic, he was the icing on top of the cake. 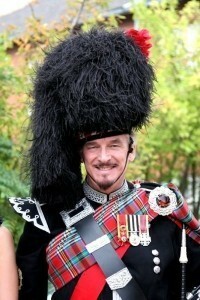 He wore our family MacLachlan tartan. He piped myself and my Dad into the church, he then piped Jim and I out of the church. Our wedding venue was another hour's drive in the opposite direction for David, he rang a few days before the wedding and very kindly offered to drive the extra distance and pipe us into our wedding breakfast. This was truly amazing. David touched so many hearts on our wedding day. I would highly recommend David to anyone! Thank you so much! "Dear David Just a quick note to say thank you so much for your part in our Daughter’s wedding at Irnham Hall Grantham. After a horrible journey down, of which you kept us informed all the way, arriving with 15mins to spare your were absolutely professional and looked fabulous in full dress Your playing was faultless and piping in of the bride and groom and toast was extra special, you were absolutely fantastic. Thank you so very much and would recommend you 100%"
David, I'm sorry I missed the chance to personally thank you on the evening. I've received great feedback regarding the evening and I believe a large part is due to your piping and your performance regarding the address to the haggis. This man was a professional and a gentleman who was very knowledgeable about bagpiping and Scottish tradition. David turned up early, went above and beyond what my father asked and what I expected. I recommend David to anyone who wants a quality piper at a very reasonable price. I am so happy with his service! • 11 Jul 2017 Piping Scot was amazing! He played brilliantly and was very attentive to detail, He looked fabulous in full dress , He was kind and listened to everything we had to say. PipingScot David also sat with my Father after the funeral and that was worth every penny. Piping Scot was early on arrival and stayed over the 45 mins we booked him for. You will not regret booking this amazing Piper for any event !! Not sure about how you do the ranking from 1-5 , so I am leaving it on 5 because I am hoping that is the highest I can give him . David, Thank you for your superb services at our wedding in York, everybody enjoyed it so much, it certainly added to a fantastic day. Thank you again. Hi David, We Wanted to thank you so much for playing at our wedding, you were fantastic and we feel you went above and beyond. Extensive experience from early school days playing for the 'School Corps,' to piping for dancing with the University 'Scottish Dance Society.' Major involvements in Pipe Bands with both parades and competitions, plus one to one teaching the instrument to new pupils. Piping for cultural exchange visits to France, Germany, Russia, Poland, USA, Japan, Hong Kong. Piping for high profile events at home and abroad, such as playing at the wedding in Kiev, for the daughter of the Ukrainian Prime Minister, Julia Tymoshenko. Prizewinner in many piping competitions. 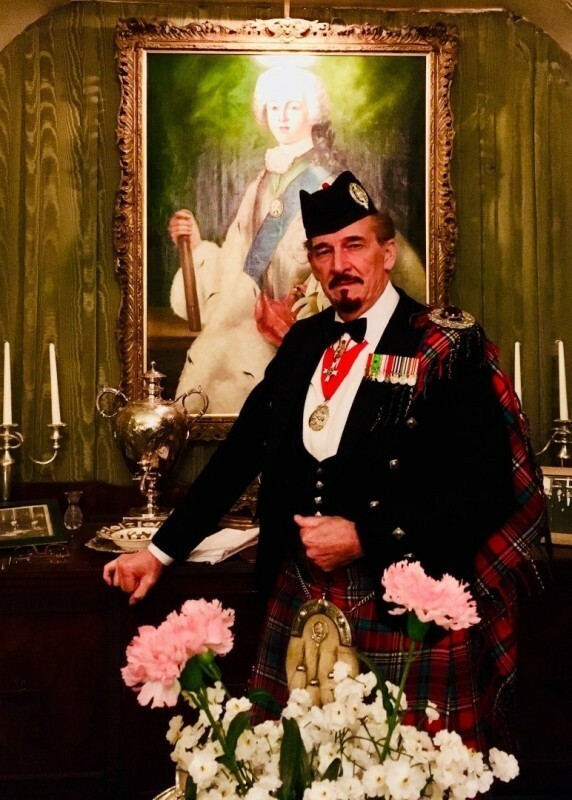 Long term personal Piper to The Duke ... of Hamilton & Brandon, and official Piper to "The Council of Armigerous Clans & Families." Innumerable Burns Suppers, funerals, weddings, birthdays, Parades, competitions, etc. Even one Hen Night!! Piping in the military sphere with the Pipes & Drums of the 1st. Batt. Scots Guards. Weddings Funerals Burns Suppers (with After Dinner Speaking & Entertainment) Birthday Parties Private Parties Corporate Events Cocktail Receptions Christenings Product Launches Trade Shows Gala Dinners.